You may have heard the term ‘Melanoma’ before. But, do you really know what it is? By age 75, 1 in 24 Australian males and 1 in 34 Australian females will develop Melanoma. This is the fourth most diagnosed cancer type in Australia, with over 3,000 new cases each year. 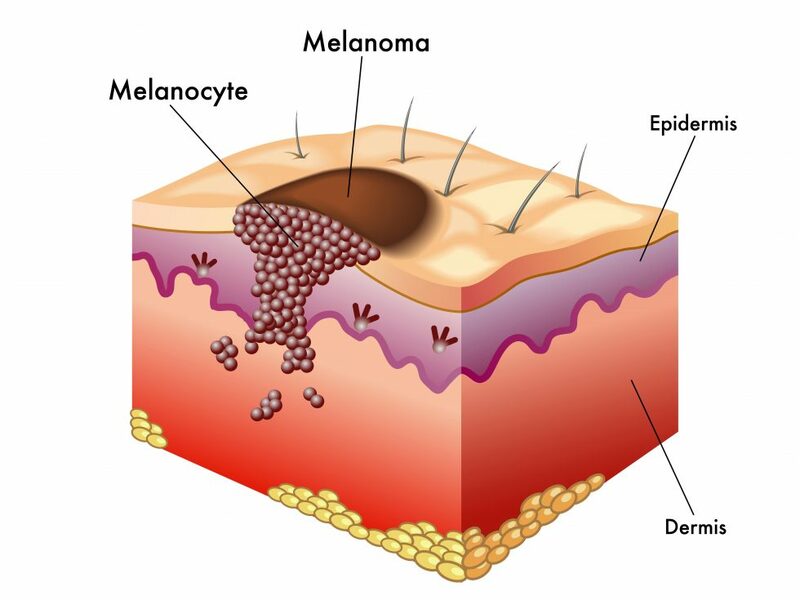 Melanoma is a type of skin cancer that develops inside the skin’s pigment cells. Your skin’s pigment cells help to protect your skin from the harmful effects of ultraviolet radiation, or sunlight. A mole is the product of these pigment cells grouping together during an individual’s childhood. Normally, most moles are safe. However, when the pigment cells that make up the mole start to divide and grow at a very quick and uncontrolled pace, a Melanoma can form. This will generally go into the deeper layers of a person’s skin, or it’ll expand in an outward direction. This type of cancer can be found all over a person’s body, but there are a few places that it is more common. You should be checking these places, especially checking the moles often. Arms and Legs – Check your entire arm, including the underarm that doesn’t see as much UV exposure. Check your entire leg as well, including the soles of your feet. Head – Your head is one of the parts of your body that gets the most UV exposure, and this is why you often find Melanoma on the scalp or the face. You should regularly be checking for any signs of skin cancer on your scalp. Neck – Your neck also sees a lot of UV exposure, and this is another area that Melanoma presents. Again, regular checks can help you catch any problems early. Trunk – Your chest, back, and your stomach are areas where you typically see a lot of moles forming. A – Asymmetry – check that both halves of the mole match in appearance, or are symmetrical. B – Borders – the borders of a melanoma are often uneven. C – Color – a variety of colours, rather than one shade of brown, could be a warning sign. D – Diameter – melanomas are usually larger than about a quarter of an inch. E – Evolving – be very wary of a mole that evolves or changes in size, shape, colour or elevation, or starts to itch, bleed or crust over. However, if you have any doubt, you should schedule a mole check at a skin cancer clinic like My Skin Centre. The staff at My Skin Centre have the training and knowledge that allows them to perform mole scans to rule out Melanoma. We have the means to run further tests, diagnose, and treat your Melanoma. My Skin Centre is a skin cancer clinic in Perth that specialises in mole checks and diagnosing Melanoma. As with any type of cancer, it is extremely important to catch and treat it early. My Skin Centre offers nine convenient locations throughout Perth and the South West. The staff is ready and willing to answer any of your questions or concerns. If you have a mole or a spot that is concerning you, contact My Skin Centre. We’ll be more than happy to set up an appointment to get your mole checked.